The Easter season is usually filled with chocolate, jelly beans, cakes, and other sweet treats. 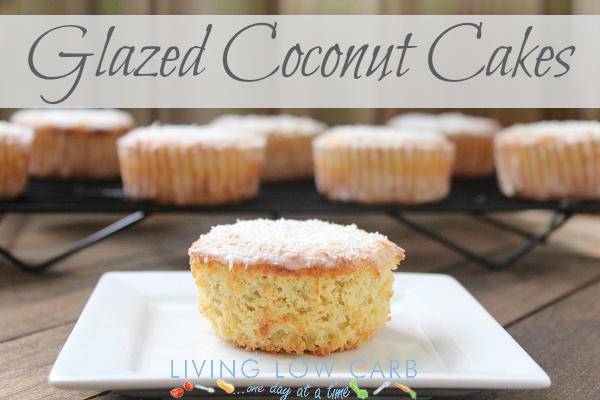 Being surrounded by all that temptation makes it really easy to “fall off the wagon.” I created some Glazed Coconut Cakes that will help satisfy your sweet tooth without derailing the progress you’ve made so far this year. Not only are these great for Easter, but any time of the year. Have you tried implementing a less candy centric Easter with your family? To reduce the candy focus, try filling the eggs for Easter egg hunts with small toys, hair clips, erasers, bubbles, bouncy balls, rings, nuts, key chains, money, or other non-candy items that your kids would love. So many stores have small trinkets for under $1 that would work perfectly for Easter egg hunts. Looking for ways to naturally dye eggs? Check out these great links from The Mommypotamus and Nourishing Joy. Mix the coconut flour, unsweetened coconut, baking soda, salt, and sweetener (if granular). In a separate bowl, mix the coconut oil, sweetener (if liquid), eggs, coconut milk, vanilla, and lemon juice. Divide evenly into 10 muffin tins lined with cupcake liners. To make the glaze, combine all the ingredients thoroughly in a bowl. Re-dip the cakes for a second coat of glaze and sprinkle with unsweetened coconut.